Although Russell and I move around a lot due to his job, we are both originally from Alabama. If you have never been to Alabama during the summer let me tell you, it is hot and humid! The minute you step outside on a hot July day in Alabama you are guaranteed to become a walking swimming pool. During these hot summer months I prefer to cook food that requires minimal use of the oven or stove--such as this cucumber salad. 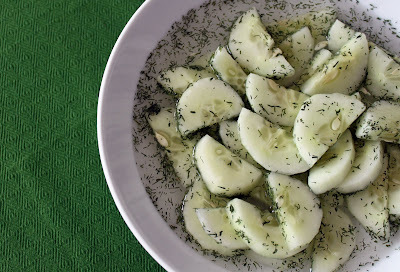 There are many variations of cucumber salad out there, but this is one of my favorites. The original recipe calls for the addition of white onion; but I prefer it without. This side dish is perfect for those hot summer days when you just want something cold to help cool you down. Combine vinegar, sugar, water, and dill. Add cucumbers and onions. Place in the refrigerator for at least 30 minutes to allow flavors to combine. Best when served chilled. Source: My sister sent me this recipe a couple of years ago. She originally found it on All Recipes-- unfortunately I am now unable to find the direct link to this recipe on their website.